The U.S. Department of State warns U.S. citizens against travel to Venezuela due to violent crime, social unrest, and pervasive food and medicine shortages. All U.S. direct-hire personnel and their families assigned to the U.S. Embassy in Caracas are subject to an embassy movement policy that limits their travel within Caracas and other parts of the country. These security measures may restrict the services the Embassy can provide. Country-wide shortages of food, water, medicine, electricity, and other basic goods have led to social unrest, including violence and looting. Security forces have arrested individuals, including U.S. citizens, and detained them for long periods with little or no evidence of a crime. The U.S. Embassy may not be notified of the detention of a U.S. citizen and consular access to detainees may be denied or severely delayed. The detained citizen may be denied access to proper medical care, clean water, and food. Venezuela has one of the world’s highest crime rates, including one of the highest homicide rates. Violent crime – including murder, armed robbery, kidnapping, and carjacking – is endemic throughout the country. 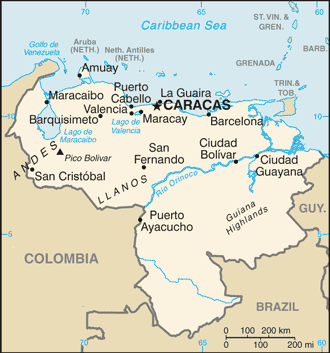 Armed robberies and street crime take place throughout Caracas and other cities, including in areas frequented by tourists. Heavily armed criminals are known to use grenades and assault rifles to commit crimes at banks, shopping malls, public transportation stations, and universities. Criminals may take advantage of power outages to target victims when lights and security alarms are nonfunctional. Drug traffickers and illegal armed groups are active in the Colombian border states of Zulia, Tachira, and Apure. The political and security situation in Venezuela is unpredictable and can change quickly. Political rallies and demonstrations occur with little notice, and are expected to occur with greater frequency in the coming months in Caracas and throughout the country. Long lines to purchase basic goods are a common occurrence throughout the country and there have been reports of unrest and violence while customers wait, sometimes resulting in looted stores and blocked streets. These incidents elicit a strong police and security force response that can include the use of violence against participants; several deaths have been reported during such protests. Due to shortages of some food and medical supplies, U.S. citizens should be prepared to cover their own needs while in country. In the event that the security climate worsens, U.S. citizens should be responsible for arranging their own travel out of Venezuela. U.S. citizens may be detained and/or deported by Venezuelan immigration officials for not complying with visa or immigration regulations. U.S. citizens traveling to Venezuela must have a valid visa that is appropriate for their specific type of travel (tourism, journalism, employment, study, etc. ).